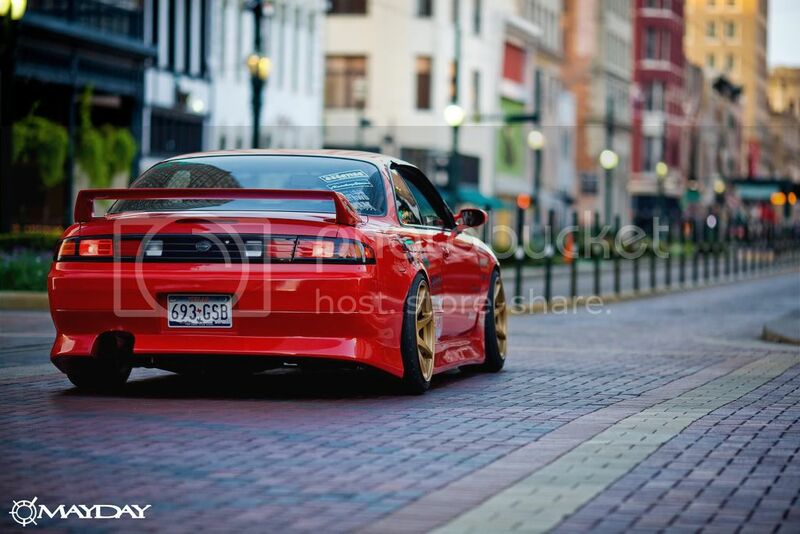 speaking of rwd turbos, how's this s14 silvia for you? pretty neat how the shallow depth-of-field makes the car look like a toy; at least that's how it looks to me. classic old skool drift skirts and offset too. pretty much a bargain buy nowadays. also just caught up with the first episode of top gear usa - mmmmmm ok. guess none of the licenced top gears will ever be as good as top gear UK - definitely the top gear australias were pretty weak. was back in about '98 i bought a vti-r honda prelude - that's the 2.2l dohc vtec, 5 stud wheel pattern for australia. great car - nice interior design, good driving position and feel. i've always been a fan of hondas, but the prelude didn't feel like it had that much power - about 200ps from the h22a, roughly - the 200sx of the same era (s14 silvia, with rwd sr20det) felt like it had a lot more go. anyway mine was eucalyptus green (not my ideal colour but got it for a great price), kept it a few years, riced it like crazy to enter car shows (hey - this was a dozen years ago, big chrome wheels and full body vinyl graphics were in, man!) then sold it when i went overseas to work. still, as the last of the preludes, they look great even a decade on - can't beat that design. ain't nothing better than a bunch of keyboard heros bignoting themselves and then getting the piss taken out of them, and of course, nowadays the whole world can join in. funnily enough, this bloke lives in my hometown - and while i've met plenty of people in the car industry who are great personalities, i think this guy isn't one of them. despite a couple of friends I know owning R35 gtrs, i still haven't made a time to go and sit in one - or drive one, if i'm particularly lucky! these two don't belong to anyone i know - but apparently the grey one has 360 rwkw and was driving hard around mt panorama - just after the owner picked it up from the dealership. that's the way to go - race prepared from the factory and damn the running in period. nice. a friend of mine has the previous model renaultsport megane (the one with the flat rear window) in blood red, red brembos with gloss black wheels - looks mean, and it's totally standard. now there's a new one - well, it's been out for a while now. more of a coupe - not sure if it stands out as much as the previous one. the styling isn't too bad - quite like the front diffuser in the bumper, wheels are a bit awful but it looks like the good brakes are still there. with a 2L turbo four cylinder and six speed, I guess the main question is would you buy one over... say... a wrx, ralliart lancer, or a golf gti which are all in the rough price bracket of AUD$40,000? subaru wrx sti - good. automatic - fail. so i was invited to a bmw dealership open night last year... i was talking to a salesman and just happened to ask if he had any e46 M3s with manual shift available, as I was thinking of trading in my gtr. his response? "no-one wants a manual, it's the SMG you want, trust me!" erm... mistake number one... specifically, I wanted a manual transmission M3. don't really care if the SMG is quicker, or holds its value better, I wanted a traditional stick shift and three pedals to dance on. anyway, long story short, most BMW salesmen/women are pricks, so don't buy one. and just a reminder of how manufacturers can sometimes get is terribly wrong, the new wrx sti sedan in australia is available as an automatic. nice way to shake off that whole annoying "hero car", aspiring rally/street driver appeal. the sti stands for (or used to represent) the top of the tree subaru performance - and now it's neutered with a slop-shifting auto and losing a whole lot of torque compared to the real sti with manual transmission. most ppl can't show the love for wagons - hey, even my fiance was hellbent against wagons, 'cause she was forced to drive a old red datsun wagon for a while and it was always breaking down. but get an eyeful of this hot white load-hauler from audi - some would say it's more of an extended hatch than a wagon given that it's a 3 not a 4, but who cares? it's low, prettyflush, and sleek. sorry for the website being down - issues with technology, right? anyway, we've been thinking about moving to a more blog style website. not that there's too few jdm blogs already, right? anyway, this car was yellow, bad-fitting evo bodykit, shiny chrome wheels and a big sticker advertising a transmission repair mechanic; nice ey? then again times change, what's acceptable, cool and trendsetting today could be regarded as tacky and dated in 5, 10 years time. whatever. do what you like, what makes you happy - long as you don't hurt anyone, all is good right? props to jdmstyledecals.com for supporting our cause and sponsoring our website stickers, go git them here.